So I just can't decide what cams to buy...I really cant. So I decided I would post a thread to see what other people think would be my best choice. Now lets take a vote. Here are the choices. I am also up for suggestions. I have skunk 2 pro 2 already. I lost power by using them. Can't say I'm much of a skunk2 fan either. So I called up bisimoto today and they are making a custom cam for me. :) bisi rocks! Yea i had to save up all my money. Ive only been spending 30$ a week, and thats for food and gas...plus it's not easy cuz I'm paying my grandpa back for the hatch. He's taking 500$ out of every pay check i get so that leaves me with very little amounts of change. SOMEONE PLEASE BUY MY SKUNK 2 CAMS!!! Why did you lose power on the Skunk2 St2's? Did you have it tuned? 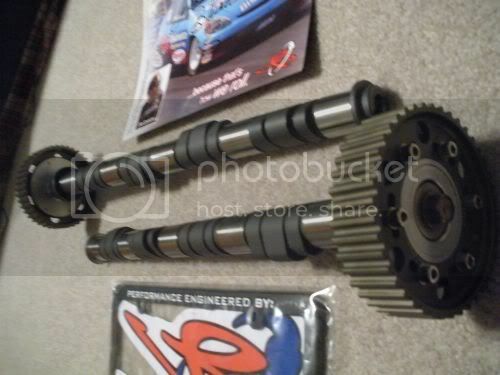 Adjustable cam gears? What supporting mods are done to the H22? Intake manifold, injectors, header? What is the compression on the bottom end? Sorry, just find it hard to believe that a cam would lose power in a proper setup. you dont do to much research than..
how much you want for them since they blow ?? 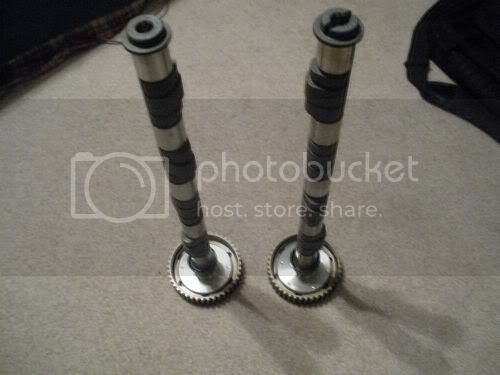 100 bucks and a skunk2 rear tie bar and a adjustable short throw shifter ?? Ive only been working with H22's since 2000. I don't know much about them. I also noticed after I re-read that he said pro2's and I said st2's as in the older grinds. I have not done much reading on the newer grinds, as I have not been focused on an all motor setup for mine since about 2003. So, yes, if that is the case that MANY people are losing power on the pro2's, then yeah, get rid of them. But my guess is that they are just a cam that needs some work to make power. Hell, I made 136whp (mustang dyno) on an 8.4:1 bottom end H22 with stock everything else. Then proceeded to go 14.91 in a stock weight 95 prelude si/vtec. Boredom I guess. So whats your setup then? Mike has some very valid questions, these arent just "throw in and run em cams!" Whats up Shawn? I need to get some parts from you for my intake manifold. Also, is there enough material in an H22A1 mani to open up for a 70mm BDL TB? If so, how soon can I get it to you, and how much? They are to big of a cam for 11:1 compression pistons...to much duration so they stay open when you want em closed so I actually lost compression by using those...yea I had more air but the loss of compression compensated for that causing a loss of power rather than a gain. This is why ppl need to do research before buying cams, throwing a monster cam on a motor might sound cool but if you don't know what your doing you will just end up wasting your money. I didn't want to do a monster cam in this thing just because of that so I had to downsize. 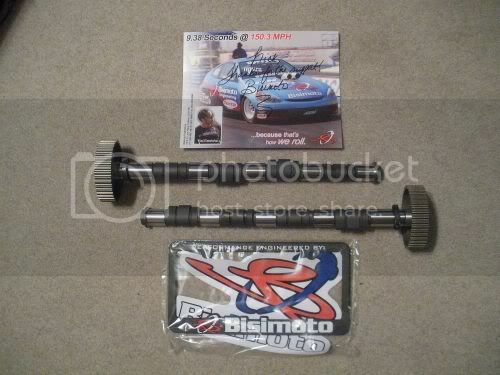 Called up bisimoto and they have a grind that one of the workers there used for his H22 prelude that is similar to my motor set up. Its close to the level 2 cam grinds but slightly different. So hopefully these end up being damn good. When they get here we will find out. You would be better off tho with a S2 stg2 cam but you should still be able to do very well with the Pro2 even tho they arent the ideal cam for your setup. I made great power with them on my 12:1 and 14:1 setups, and now I'm making about 5whp more running the Pro3's. For an off the shelf cam S2 is hard to beat. yeah its just a lil h23 vtec. I went with bisi tho. Similar grind to there level 2 cam. And I am going to dyno tune it so lets see what she can do! Ill be posting up a before and after dyno sheet so everyone can see the difference. 2.5? What kind of a setup are you running? Bobby, there were plans to boost it, but life got in the way. It is ok, just made a little over 500 on my current setup and had some very happy results at the track. 500hp? N you didn't turbo it? Giant shoot of nitrous? As for my set up. Its not done. But what I have Crower crank, ,bisi moto custom piston 12.5 to 1 88.5. So really its only a 2.47. I have alot more just don't feel like sharing. Rosko I just realized I was emailing you about two weeks ago. About a k24 crank in h22. So ya that's what happen to me know. Cool man, that Crower crank should do the trick! Let me know how the setup turns out! No. Did not end up boosting the H22. Still have it sitting around so maybe mess with it again in the future, but currently working with a dinky, torque-less 1.8 that is paired with a snail that has not even started to work hard.